Lines formed outside Little Pete’s Restaurant at 17th and Chancellor for the last day of business on Memorial Day. Maybe it's because all the best and worst moments of our lives tend to happen at 3 a.m. — and because at 3 a.m., there's no place to go but Little Pete's — but the compact diner at 17th and Chancellor Streets holds an outsize place in Philadelphia's collective consciousness. It closed Monday, after 38 years, an epoch that really is not very long in the grand scope of Philadelphia history. And yet, for many city dwellers, it feels like the loss of a civic institution. It left behind lots of memories, as well as some vinyl booths, stools, and signs that will, as of Thursday, be in the possession of the Philadelphia History Museum at the Atwater Kent, which is scrambling to preserve the diner's physical remains, if not its soul. "We get called when something is closing," said Kristen Froelich, director of the collection and exhibitions. The museum, she said, has salvaged seats from Veterans Stadium, lights from the Society Hill Playhouse, and looms from the Quaker Lace Factory. "We get to celebrate the end of something, instead of celebrating it while it's still with us. It's heartbreaking." 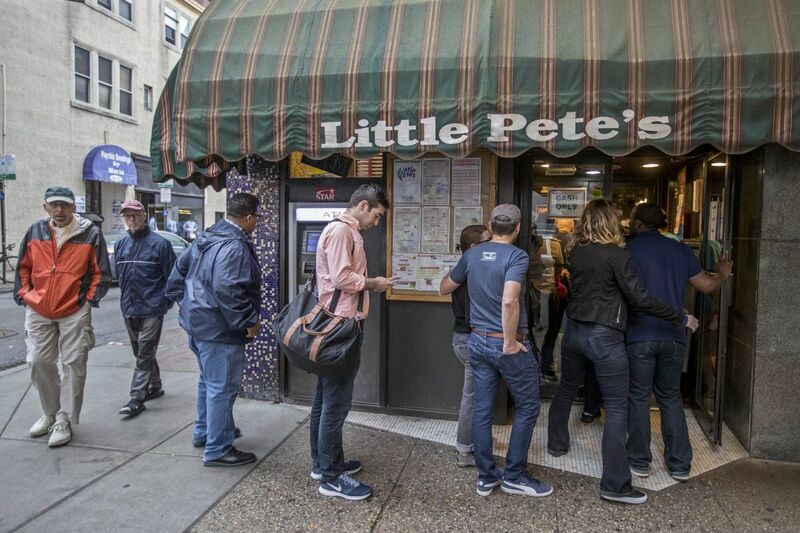 So, we invited Philadelphians to remember Little Pete's as it was, gathering recollections by email, on social media, and from those stopping by during its final days to talk with staff. Here's what you told us (edited for length and clarity). "There are a lot of regulars who come in here because this is their time to talk to somebody. They don't have anybody at home. Some don't even have kitchens," said Debbie Pegolese, 63, of South Philadelphia, who has worked as a waitress at Little Pete's for a dozen years, on and off. She knows them by their orders. "Once I was out with my kids, and I said, 'There goes iced-tea-chicken-cheesesteak.' "
After that, she made a point of asking names. Still, it's a strange kind of intimacy. "You know somebody so well, you know what they eat, what they drink. But if they don't come in, you don't know where to find them. A gentleman used to come in three or four times a day. One day, he passed out and fell off the stool. He was taken away in an ambulance, and we never saw him since. People are in your life every day, and one day, they're gone." Working as the cashier on one of Little Pete's final afternoons was Sam Przybylski Jr., 27, who had worked there for 10 years. His mother, Barbara, has worked there 37. "I practically grew up here," he said. "If I wasn't in school, or if I got in trouble in school, I would be here." He's hoping to work in the shipyard in Chester next — he has had his fill of customer service. But some of the regulars he'll miss. "There's a few customers that call almost every day," he said, "solely for the purpose of having someone to talk to." When he gets bored or a kid calls, he'll answer the diner phone in an accent or the voice of a cartoon character. "I can do anything from Shaggy to Scooby Doo," he said. "Chewbacca gets me yelled at." Little Pete's Restaurant co-owner John Koutroubas, center, buses a table during the busy morning crowd at Little Pete’s on the final day of business for the restaurant on Monday MAy 29, 2017. "In the last 10 years of my grandparents' lives, they ate dinner at the Little Pete's at 19th and Chestnut at least five times a week. Never a great cook to begin with, my grandmother had a stroke in 1991 that left her with few words and no confidence in the kitchen. My grandfather, overwhelmed with taking care of her, decided eating out was the best option. Dinner came with soup, salad, two vegetables, a drink, and dessert. Often, they split an entree, my grandfather taking the soup and my grandmother carefully dressing each forkful of salad with just a dab of ranch. They almost always went home with white Styrofoam containers of leftovers. "As a junior in college, I spent a semester in Philadelphia. Several times a week, I'd join my grandparents at Little Pete's. My grandfather would read me the menu, calling out his favorites for particular consideration. "I arrived at my apartment building one night around 1:30 a.m. to find I couldn't enter. The key issued by my landlord had been poorly cut, requiring a series of jiggles and jerks so that I always felt like I was breaking into my own place. But tonight, the damn key just wouldn't turn. Where does one go at this time of night with nowhere else to turn? Little Pete's. "I sat at the counter and ordered an omelet and bottomless cup of coffee. An hour later, I was dozing, only to be awoken with a polite but stern, 'You can't sleep here.' But it only took another 20 minutes and an empty diner to find one waitress and line cook sleeping in the corner booth, and the cashier slouched, eyes closed, behind the register. I took this as permission to nap. One person taking the closing philosophically: Ioannis "John" Koutroubas, 57, co-owner of Little Pete's for 38 years. He has seen the diner, and the city, through ups and downs. "The middle of the '90s were a bad time. People were afraid to go to Center City. It's progress. The whole city is getting developed," he said. But some things have changed for the worse. People used to wait in line peaceably for a table at night. In the last couple of years, he has had to hire a security guard. With the original Little Pete's closed, he said, "I'll go give my brother Pete a break at the other location, at 24th and Fairmount. He hasn't had a vacation in 11 years. "It wasn't easy," he said, "running a business 24 hours a day."